Customers can gift 1-month, 3-month, 6-month, 9-month or 1-year video subscriptions. How’s it work? 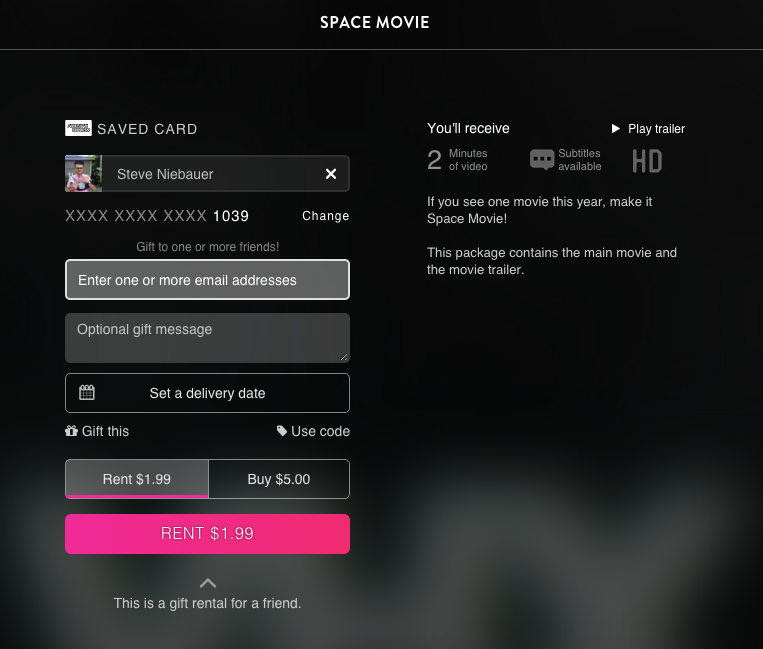 If you’re running a subscription video service, when a customer checks out they simply click “ Gift to friend” and enter the email address of the giftee. The recipient gets an email, and can instantly activate their subscription and start watching. A streaming video subscription means you’re not just giving a single video, but an ever-expanding library of videos! You could gift a whole year of yoga classes, or send a few months of unlimited living room karaoke. Oh wait, speaking of holidays: You can set a delivery date for any video gifts on Vimeo OTT. When your customers gift a subscription or an individual video package, they can opt to have it digitally delivered on a particular date. Send it on Christmas morning and it will arrive in the recipient’s inbox, shining and bright and digital! Or if Christmas isn’t your thing, customers can send any day — from New Year’s Eve, to a birthday, to…the winter solstice. So let your customers know how easy it is to gift your videos to their friends and fam. (If you didn’t already know, digital video is an amazing last-minute present.) Shout out gifting on your social media channels, or email your followers a great coupon to inspire their holiday video spirit. If you're selling transactional products (purchases/rentals), the Vimeo OTT checkout form makes it easy for your customers to gift anyone. They simply click the Gift This button, enter the recipient's email address (or addresses - we allow up to 100 comma separated email addresses), enter an optional gift message, and set an optional delivery date. Once purchased, we'll send the recipient an email to redeem and start watching right away, or if you have a delivery date set, we'll send it then! The customer can select either the rental or purchase option, when enabled.